Copyright © 2019 by MusicAlliance Inc. All Rights Reserved. MUSIC IS AN INSTRUMENTAL PART OF A SOUND EDUCATION! Click here to watch an awesome TED-Ed video on how learning & playing a musical instrument enhances brain function! 159 students representing 45 schools participated in the 2018 Summer Honor Band Program - our annual week-long honor band day camp that rehearsed from June 11th - 16th, and which culminated in a performance in the Magnificat Performing Arts Auditorium on June 16th. The concert featured Honor Bands 1 & 2 performing a wide variety of musical selections. With a staff of 11 teachers, MusicAlliance is a northeast Ohio based non-profit 501c3 music education & performing arts organization, founded in 2004, which provides band programs for schools throughout the Cleveland metropolitan area, and which also operates band programs for homeschooled students, and honor band programs that include both non-public and public school students. We believe that studying a musical instrument has many far reaching benefits which play an essential role in the creative, social, emotional, and cognitive development of children. Participation in band helps to cultivate a greater love, appreciation, and understanding of music - one of humanity's oldest art forms and means of expression. Learning to make music in a school band program fosters a sense of belonging and accomplishment while also promoting self-esteem, self-confidence, self-expression, self-discipline, teamwork, and organizational skills. Scientific research into the effects of studying music continue to produce new data about music's relationship to brainpower and academic success. University research studies have shown that students who participate in instrumental music score significantly higher than their non-band peers in standardized tests (such as the S.A.T.). Furthermore, significant correlations have been found between the number of years of instrumental music instruction and academic achievement in math, science, and language arts*. When you consider the positive force that music education can be in the lives of both children and adults, we think you will agree that Music is an Instrumental Part of a Sound Education! 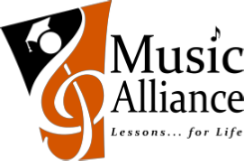 Click here to see a full list of our supporters and to learn about ways that you can help support MusicAlliance. You can support MusicAlliance by clicking the Donate Button above and making a donation. Friends and Family can help with parent-paid band tuition by purchasing a Gift Certificate in various amounts. The gift certificate amount will be applied to a MusicAlliance band student’s account and a hard copy of the Gift Certificate will be mailed out. Click Here to Purchase a Band Tuition Gift Certificate.